Bamboo is known for its many functional uses in the garden as well as its elegant beauty. There are many species of different sizes, colorations and growth habits, but all give a lush, tropical look to the landscape. Bamboo plants are lucky in feng shui applications and have other uses beyond landscaping as well. Bamboo is an evergreen member of the grass family with woody stems, ranging from one foot to nearly 100 feet in height. Many of the largest varieties of bamboo are from the tropics, but there are plenty to choose from for temperate climates, as well. Bamboo is hard to match aesthetically, or for its growth rate. It can grow up to a foot per day, making it one of the best plants for an instant screen. The canes are slender and graceful with leaves that flutter in the slightest breeze, and come in various shades of green, yellow, blue, black and red. 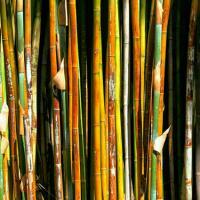 Bamboo species fall into two main categories - clumping bamboo and running bamboo. The former grows as neat tidy clumps with the canes spaced very close to one another. The latter are the varieties that have given bamboo a reputation as an invasive species because the plants spread via long underground rhizomes, making them capable of colonizing large areas. Running bamboo should be planted with a barrier limiting how far it can spread. This can take the form of a pot or planter, or an impenetrable material such as sheet metal or heavy-duty plastic or rubber can be used underground. Installing an underground barrier is extremely labor intensive as they need to be buried in a trench at least 24 inches deep. Allow the barrier to extend six inches aboveground, as well, to keep the rhizomes from going up and over. Rows of bamboo are useful as a privacy screen while individual clumps make a great focal point or tropical accent. It is also one of the most popular plants for Zen or other Asian-themed gardens. The tiniest dwarf varieties are useful as a groundcover. If you have space to let the running varieties roam, you can plant an enchanting bamboo forest; large groves of bamboo tend to out-compete all other plants, creating a very primeval feel along a garden path. Bamboo poles are also infinitely useful as garden stakes and for all sorts of landscaping projects, from building trellises and creating shade structures to making fountains and wind chimes. Historically, it has been used for everything from fishing poles to flutes. 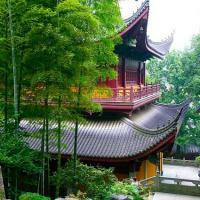 Today there is a commercial industry to grow and harvest bamboo for flooring and other construction purposes. It is even possible to make fabric with bamboo. Finally, the young shoots of bamboo are edible. Species like Bambusa edulis and Phyllostachys dulcis are some of the most delectable and are commonly incorporated into Asian cuisine. 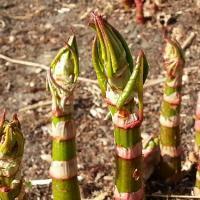 The shoots should be picked just as they are emerging from the ground while they are tender - once they are more than a few inches tall, the flavor and texture become unpalatable. 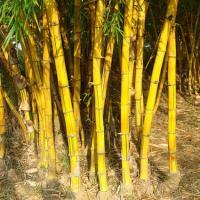 Bamboo grows best in rich, moist soil with good drainage and tolerates full sun or partial shade. Mature groves can with stand some drought, but it is a plant that thrives on moisture - the more you give it, the faster it will grow. The same is true for nutrients, especially nitrogen. Incorporate lots of compost at planting time and feed it high nitrogen fertilizers throughout the growing season if you want it to fill in as quickly as possible. Other than containing the rampant growth of the running varieties, the only other maintenance involved in growing bamboo is to periodically remove the oldest canes, which slowly lose their leaves and decline after a few years. Heavy mulching is helpful for conserving moisture. Bamboo is not bothered by pests or disease. 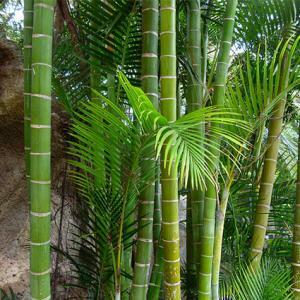 Bamboo is commonly available in garden centers and there are scores of varieties available for landscapes of all sizes. The following clumping varieties are suitable for USDA zones 8 to 11. Giant timber bambooo (Bambusa oldhamii) is one of the largest clumping varieties, growing up to 50 feet tall with 4-inch diameter canes. 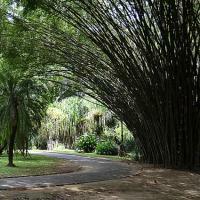 Weaver's bamboo (Bambusa textilis) is a smaller clumping variety, growing to just 20 feet with one-inch diameter canes. Golden bamboo (Bambus vulgaris) grows to about 30 feet in height with two-inch diameter canes and unique green striations on the yellow canes. These running varieties are hardy in USDA zones 5 to 11. 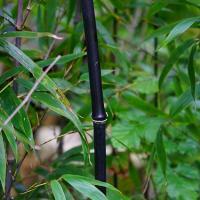 Black bamboo (Phyllostachys nigra) has jet black one-inch diameter canes and grows to about 20 feet. Pygmy bamboo (Sasa pygmaea) stays about two feet tall, forming a thick groundcover. Yellow groove bamboo (Phyllostachys aureosulcata) grows to about 25 feet and is noted for the yellow striations on the green canes. Bamboo is one of the most versatile landscaping plants as long as you respect the potential problems associated with the running varieties. They may start off seeming well-behaved, but ten years later can take over your yard and your neighbors.